Habit: Subshrub, shrub, <= 5 m, resinous, generally gland-dotted. Stem: generally ascending to erect, glabrous to woolly; often resin-dotted and resin-coated, stalked-glandular in some. Leaf: alternate, thread-like to elliptic or wedge-shaped, entire. Inflorescence: heads radiate or discoid, 1 or variously clustered; involucre cylindric, obconic, or bell-shaped; phyllaries in 2--7 series, +- lanceolate to ovate, generally resinous, persistent when dry, tips erect to recurved, obtuse to acuminate or tailed, midrib often thickened with a resin gland; +- flat to convex, pitted, epaleate. Ray Flower: 0--30; corolla 2--12 mm, generally yellow (white). Disk Flower: 4--70+; corolla 3--11 mm, generally yellow (white); anther tips narrowly triangular to awl-like; style tips lanceolate to awl-shaped. Fruit: 2--8 mm, cylindric to ellipsoid or +- obconic, generally angled, ribbed; pappus of minutely barbed bristles in 1 series. Species In Genus: +- 36 species: western North America. Etymology: (Greek: golden shrub) Note: Most species flower summer/fall. Some hybridization among species. Habit: Plant 4--15 dm. Stem: glabrous to +- puberulent, resinous. Leaf: 10--55 mm, linear, acute; base narrowed, glabrous to +- hairy, gland-dotted in pits. 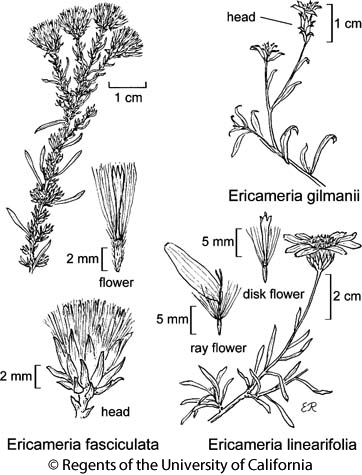 Inflorescence: heads radiate, 1; peduncle 20--70 mm, generally bractless; involucre 8--14 mm, 10--18 mm wide, hemispheric; phyllaries +- leaf-like, +- equal in 2--3 series, linear to lanceolate, acuminate, stalked-glandular, center green, margin cut-ciliate, scabrous. Ray Flower: 12--18; corolla 9--20 mm. Disk Flower: 16--60; corolla 6--10 mm; style appendage +- = stigma. Fruit: 4--5 mm, compressed, 6--8-veined, densely silky-hairy; pappus 5.5--7 mm, white. Chromosomes: 2n=18. Ecology: Dry slopes, valleys, foothill and desert woodland, saltbush and creosote-bush scrub; Elevation: < 2000 m. Bioregional Distribution: NCoRI, s SNF, Teh, ScV (Sutter Buttes), s SnJV, e CW, TR, PR, DMoj, w DSon; Distribution Outside California: to southwestern Utah, western Arizona, northern Baja California; southwestern Colorado?. Flowering Time: Mar--May Note: Hybridizes with Ericameria cooperi. Citation for this treatment: Lowell E. Urbatsch 2012, Ericameria linearifolia, in Jepson Flora Project (eds.) Jepson eFlora, http://ucjeps.berkeley.edu/eflora/eflora_display.php?tid=2598, accessed on April 24, 2019. NCoRI, s SNF, Teh, ScV (Sutter Buttes), s SnJV, e CW, TR, PR, DMoj, w DSon; Markers link to CCH specimen records. Yellow markers indicate records that may provide evidence for eFlora range revision or may have georeferencing or identification issues. Purple markers indicate specimens collected from a garden, greenhouse, or other non-wild location.